After 27 years in law enforcement — 22 of those in North Escambia — Byrneville resident Randy Murph has retired. Life is a little more relaxed these days for Murph — when we caught up with him, he was working on a cedar chest for his granddaughter. He admits that when he watched a deputy responding to call past his house recently, it was hard not to grab the police radio and find out what was going on. Law enforcement is in his blood. Murph started his law enforcement career in Escambia County, Alabama, working for then-Sheriff Tim Hawsey. He spent five years patrolling the 950 square miles of the county before moving south into Florida. For the next 22 years, he worked for the Escambia County (Fla.) Sheriff’s Office, spending all of those years in North Escambia. “From all I know about Randy Murph, he was a very good officer, the kind you are proud to have,” Escambia County Sheriff’ David Morgan said. Along with the good people in North Escambia, Murph has seen his share of the bad in the area. The dumbest criminal Murph said he remembered was a group that stole candy from the Little League ballpark in Century. He admits it did not take great skills to solve the crime — as the crooks fled the ballpark, they began to eat the candy. And drop candy wrappers — all the way to their own front door. “When I knocked at the door, they fessed up,” he said. Talking to criminals means excuses. Murph’s favorite came from a speeder on Highway 29. “Ma’am, are you trying to get to the emergency room?” he said he asked. “Sir, there’s a state trooper on Highway 29 using radar, and I’m trying get away from him,” she replied. She did not get a ticket — at least from Murph. Then there are the cases that Murph does not like to talk about, even after 27 years with a badge. “We knew he did it, but he never got convicted,” he said. But sometimes justice prevails. The suspect in that case is now serving a life sentence without the possibility of parole in Georgia for other crimes. “He got what was coming to him,” Murph said. The best memories come from the simple words — “thank you”. The words meant something to the man, and he did turn his life around. Now that he is retired, Murph said he plans to fish, hunt and travel. 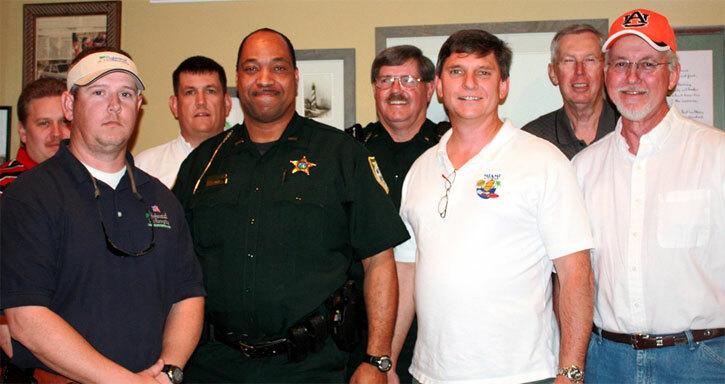 Pictured top: (front, L-R) Senior Deputy David Poole, Lt. Carl Jones, DEA Special Agent Claude Cosey, Master Deputy Randy Murph, (back) Deputy Ingram, Senior Deputy David Preson, Lt. David Barnes, and Investigator Frank Way at Randy Murph’s recent retirement party. Pictured top inset: Randy and Mary Murph. 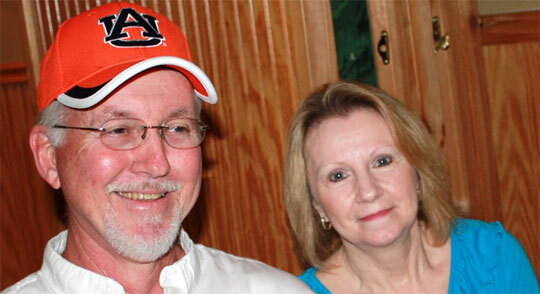 Pictured middle inset: Former Escambia (Ala.) Sheriff Tim Hawsey and his wife. 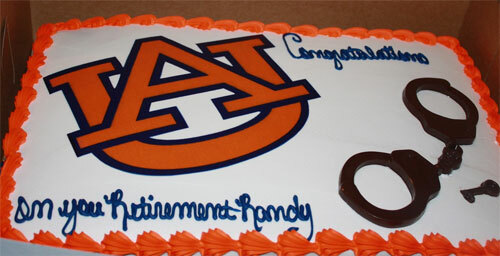 Pictured bottom inset: Randy Murph’s retirement party cake. Submitted photos by Ramona Preston for NorthEscambia.com, click to enlarge. 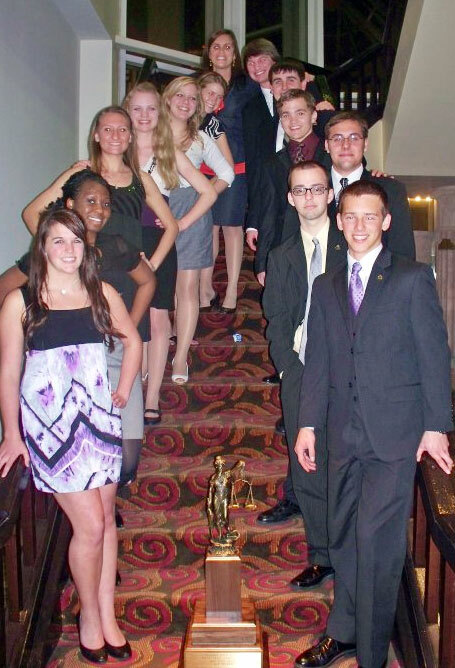 Members of a Mt. Vernon, Ala., church are speaking out after the arrest of one of their pastors in Century on 16 drug related charges. Several members of the AOH Church of God in Mt. Vernon are upset that they learned that Bertha Y. Wright, 43, had been arrested indirectly from an article on NorthEscambia.com rather than from Wright. She was charged with 11 counts of possessing a controlled substance without a prescription, three counts of obtaining a controlled substance by fraud, one count of trafficking in hydrocodone and one count of possession of a blank prescription after being arrested at Century Pharmacy earlier this month. Church members said that they eventually learned of the arrest after a March 11 story on NorthEscambia.com, not from the associate pastor. Tuesday, the church members forwarded an email news release to several Gulf Coast news media organizations in hopes that more media would run the story. 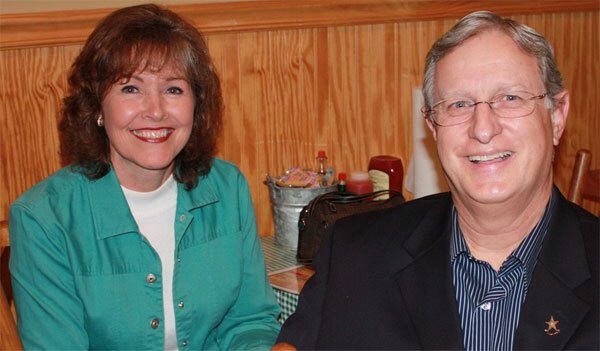 Williams told the Mobile-Press Register that Wright is the wife of the church’s pastor, and she does preach some sermons at the church. 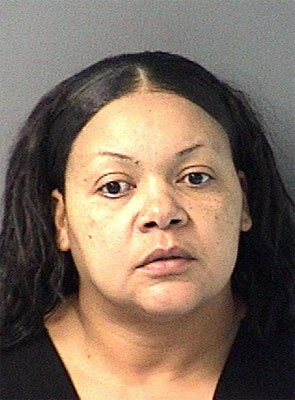 Wright was freed from the Escambia County Jail on $34,500 bond. She is scheduled to appear in Escambia County Circuit Court in an arraignment hearing before Judge Joel Boles. When Wright attempted to fill three prescriptions at Century Pharmacy on Mayo Street in early March, the pharmacist suspected that they were fraudulent. Julie Moran called the doctor that allegedly issued the prescriptions, Dr. David Smith in Jay, and determined they were indeed fraudulent, according to the Escambia County Sheriff’s Office incident report. The first prescription was written for Phenergan and codeine. The second was for 180 methadone tablets, and the third was for 120 Soma tablets. All three were dated March 3, 2010. Deputy David Bashore contacted Dr. Smith by phone, and he advised that he last saw Wright in February and had written no new prescriptions for Wright. Inside Wright’s purse, Bashore located an unlabeled prescription bottle containing methadone, a bottle with generic Lorcet and generic Soma mixed together, and a third bottle with methadone. When deputies Michael Coburn and Tod Day searched Wright’s vehicle across the street from the pharmacy, they discovered a variety of medications — the sheriff’s office incident report lists about a dozen other medications by their identification numbers. The report identified 127 hydrocodone tablets and the muscle relaxer Carisoprodol. An ice-filled cooler in the vehicle also contained three bottles of an unknown substance, according to deputies. The vehicle and the medications were seized as evidence by the sheriff’s department. The Northview Chiefs remain on top of District 1-2A with a perfect district record after a 4-3 win over Freeport Tuesday night. The Chiefs are now 13-4 overall and 7-0 in the district, outscoring district opponents 63-8 this year. Winning pitcher was Austin Reid (5-1) with two and one-third innings on the mound. Reid gave up one run, three hits, one base on ball and had three strikeouts. Brad Lowery pitched four and two-third innings. Lowery had five strikeouts and gave up two runs. Hitters for the Chiefs were Brad Lowery 1 for 3 with one RBI; Austin Reid 1 for 4 with the winning run in the bottom of the seventh; Dabney Langhorn 2 for 4 with a double and the winning RBI; Dakota Stuckey 1 for 3; Heath Burkett 1 for 3; Austin Lowery, 1 for 2 with a homerun, two runs and one RBI; Aaron Chancery, 1 for 3 with a triple and one RBI. The Chiefs scored four runs on eight hits and had one error. The Northview Chiefs will be back in action on Saturday, April 3 at home against T.R. Miller. The junior varsity plays at 10, and the varsity will play at 12:30. A Cantonment man has received the maximum sentence allowed by law after being convicted on cocaine charges. 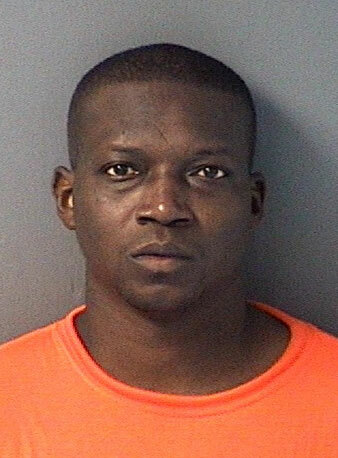 Jerry Derrell Paige was sentenced to 15 years in state prison by Judge Frank Bell immediately after being convicted by an Escambia County jury on a charge of selling cocaine, according to State Attorney Bill Eddins. One June 11, 2008, two undercover deputies with the Escambia County Sheriff’s Office Narcotics Unit purchased crack cocaine from Paige while conducting a narcotics investigation at the Grantwood Apartments in Cantonment. Paige was a nine-time convicted felon, including a 1998 armed robbery conviction for which he was sentenced to state prison. He had recently been released from the robbery sentence when he sold the crack cocaine, according to Eddins’ office. Tickets are still available for both shows for the Northview FFA Alumni Bluegrass Festival featuring Marty Raybon on Saturday, and the Northview Tribal Beat Band has announced plans to join in the event by providing refreshments. The Northview Band Boosters will be selling gumbo for $3 per bowl, hot dogs for $1, and chips and drinks for $1 before and during the concerts to raise money for an upcoming trip to Orlando for a performance at the Music USA 2010 Festival. It is not necessary to attend the concert in order to purchase the concessions and support the band. Several political candidates will have tables set up in the lobby before the concerts to meet and greet the public, including Doug Broxson, Dave Murzin, Walter B. Hill and Larry Walker. The concerts at 2 p.m. and 6 p.m. will feature Marty Raybon, a man that achieved legendary status in country music — 13 number one singles, 22 songs on the charts, a Grammy Award, and a CMA Vocal Group of the Year trophy. To purchase tickets click here to order online and print at home/work. Tickets are also available at ticket outlets — Davisville Country Store at 10251 Highway 97, the Ann’s Hallmark & Gift Shop at 1741 E. Nine Mile Road in Pensacola, and the Ann’s Hallmark & Gift Shop at 4805 Hwy. 90 in Pace. Marty Raybon is perhaps best known as the former lead singer of the country mega-group Shenandoah from 1985-1996. He led Shenandoah to 22 singles on the Billboard Hot Country Songs charts, including thirteen number one singles, such as: “The Church on Cumberland Road” (1989), “Sunday in the South” (1989), “Two Dozen Roses” (1989), “Next to You, Next to Me” (1990) and “Butterfly Kisses” (1997). At the top of the charts, Raybon became known for his bluegrass and gospel-influenced semi-traditional country sound. Both shows will also feature local favorites Dog River Boys and Delta Reign. 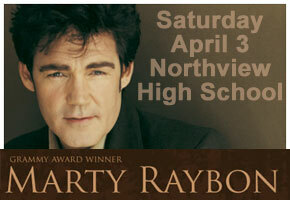 Saturday’s concerts will benefit the Northview FFA Scholarship Fund. If you have not paid your real estate or tangible personal property taxes yet, today is the last day to pay to avoid late fees.All unpaid taxes will be delinquent April 1, according to Escambia County Tax Collector Janet Holley. A penalty of three percent for real estate and 1.5 percent for tangible taxes will be assessed on April 1. Over $38 million (approximately 15 percent) of the tax roll remained unpaid as of last week. All Tax Collector offices will be closed Friday, April 2, in observance of Good Friday. 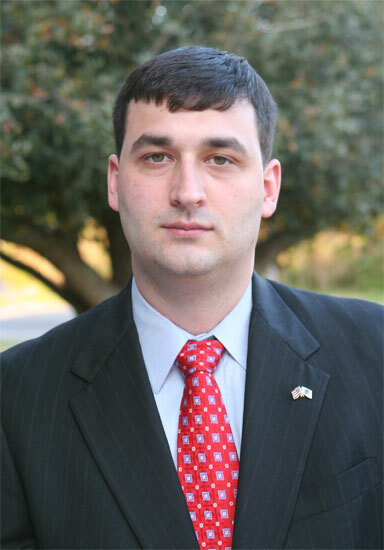 Heath Jackson, an Escambia County (Fla.) Sheriff’s Office Narcotics Division investigator, has announced that he is running as a Republican for sheriff of Escambia County, Ala.
“Jackson was born and raised most of his life in Brewton, Alabama. Heath is the son of Thomas Wayne and Terry Sherrer Jackson. After graduating from T.R. Miller High School in 1999, he began his pursuit of a lifelong dream in law enforcement. He attended the city of Montgomery’s Advanced Criminal Justice Academy and became a sworn peace officer in the state of Alabama in January 2000. “He has completed numerous hours of training with U. S. Customs Service, the U.S. Department of Homeland Security, U. S. Department of Justice Federal Bureau of Investigation, U. S. Department of Justice Drug Enforcement Administration, Department of the Treasury Bureau of Alcohol, Tobacco and Firearms, and multijurisdictional training. Additionally, specialized training was completed at Faulkner St. College, Bay Minette, Alabama and Chipola College, Marianna, Florida. The scope of training includes Federal Bureau of Investigation certification as a firearms instructor as well as an M26 advanced Taser and Taser X26 instructor. “Jackson began his tenure with the city of Brewton’s Police Department as a patrol officer, quickly realizing the need for the active and aggressive stand needed with the rising number of drug-related crimes in the county. He then began increasing the scope of his involvement by joining the 21st Judicial Circuit Drug Task Force as a narcotics agent, investigating all types of crimes from drug investigations, burglary and homicide, and successfully testifying countless times in state and federal courts. During his time on the Task Force, Jackson was also recruited by the Bureau of Alcohol, Tobacco, Firearms and Explosives. He served as a Task Force Agent for more than four years, assisting federal law enforcement in the successful arrests and prosecutions of individuals who violated gun and explosive laws. “After six years with the 21st Judicial Circuit Drug Task Force and a desire to broaden the scope of his experiences, Jackson became an investigator for the Escambia County Sherriff’s Department, Pensacola, Florida. Assigned to the Narcotics Division, he has spearheaded numerous investigations in organized crime, drug trafficking, and prostitution. It should be noted he is one of the few investigators in Alabama who has successfully completed the rigorous and stringent requirements for the Drug Enforcement Administration’s Basic Narcotics and Dangerous Drugs Law Enforcement School. Heath has an unmatched working knowledge of every community in Escambia County, Alabama and Escambia County, Florida. He understands today’s issues and has the vision to meet tomorrow’s challenges. “Heath has proven he has a calm demeanor in any situation based upon the myriad of experiences requiring strategic and tactical planning. He recognizes the damage and public risk caused by illegal drugs in our county and for the last nine years has aggressively worked as an officer with narcotics interdiction and investigations as his primary focus. He strongly emphasizes that the children of today need to be told early the importance of becoming law abiding citizens and most of all, the importance of an education. Recognizing that more than 90% of all crimes committed in Escambia County Alabama have a root cause related to illegal drugs and alcohol, the only way to combat a problem of this magnitude is to address it head-on. “Jackson knows the importance of conviction, dedication, professionalism, and the strength of genuine effort. With an honest, forthright and no-nonsense approach to public service, he is committed to building on the successes of those who have served before him and continue to focus on ways to improve. As an investment in the future of the Escambia County, he will be a driving force in ensuring safety and trusts are restored within the county. He has been blessed with numerous accomplishments and received accolades for his involvement with the youth of the county for supporting the Youth Police Academy at Jefferson Davis Community College and Brewton Police Department’s Citizens’ Police Academy. “Jackson is an active member of the Alabama Narcotics Officers Association, the Alabama Sheriffs’ Association, and the National Rifle Association. In Tuesday’s action, the Escambia Gators beat the Pine Forest Eagles 14-4 and the Tate Aggies beat Coral Reef (Miami) 10-1. Tournament championship games will be played on Friday. 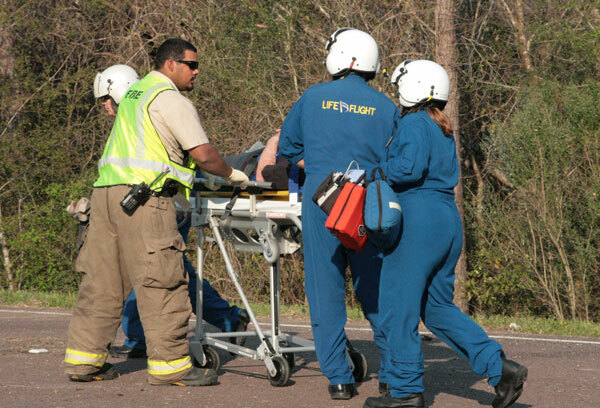 One person was transported to a Pensacola hospital by helicopter following a single vehicle accident this afternoon on Highway 29. The accident happened just before 5 p.m. on Highway 29 about a mile south of Bogia Road. The driver of a southbound pickup truck lost control, crossed over the median, rolled over and hit a tree on the northbound side of the highway. The driver was transported from the scene by LifeFlight. His condition was not immediately available. The northbound side of Highway 29 was closed for about half an hour due to the accident. The McDavid and Molino Stations of Escambia Fire Rescue responded to the call, along with Escambia County EMS and the Florida Highway Patrol. The accident is still under investigation by the FHP. Further details were no available. Pictured top: The driver of this pickup was injured in a Tuesday afternoon wreck on Highway 29 south of Bogia Road. 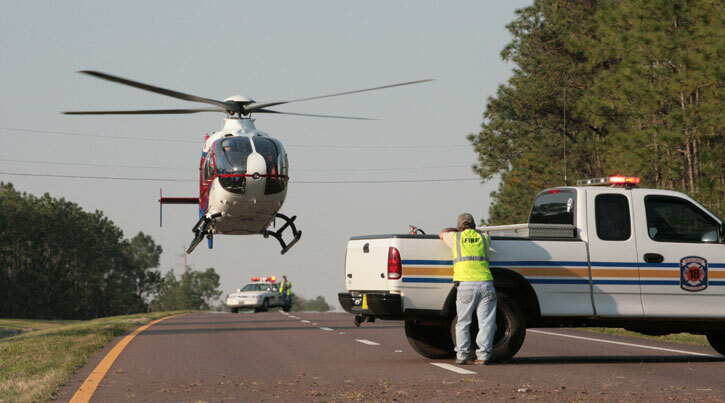 Pictured inset: The injured driver is taken to a waiting LifeFlight helicopter. Pictured below: LifeFlight lifts off from the scene. NorthEscambia.com photos, click to enlarge.